Ever look at those drawings in Crevasse Rescue books (MFOTH, remember the older editions?) and get all turned around and confused? Ya, me neither. These Pics are from a seminar I took a few years back from Northwest Mountain School. 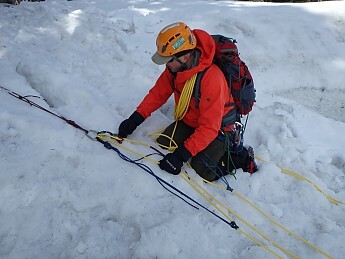 Looking at these pictures doesn't make you mountain-ready BTW, there is plenty you aren't seeing, like padding the crevasse lip, escaping the system, building anchors, checking the victim, catching the fall, etc. If it all ever looked confusing to you, here are a few more pics to add to your confusion, or possibly illuminate. 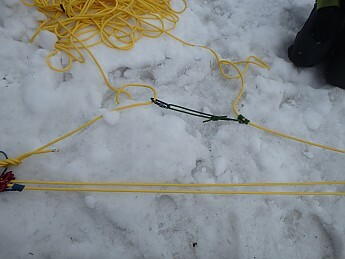 After escaping the weight of the victim with a quick clove hitch backed up with a (blue) prusik I get to fashioning the 3:1 pulley. Attaching the pulley. I am still secure to the system with my own small waist prusik (also blue). 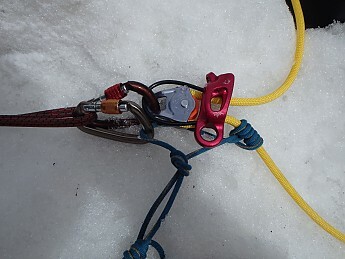 Close-up of the pulley and my ATC for managing the prusik. Some will omit the ATC but I had it so I used it. The prusik captures my progress so I can take breaks from pulling. Another pulley on the weighted (victim end) line gives me a 3:1 mechanical advantage. I pull on the top line in the pic. 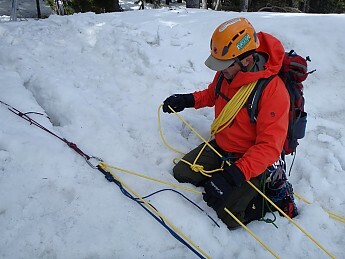 My pulley weighs less than a locking carabiner and provides less friction but many just use a carabiner here. If 3:1 is too much weight (and it can be if you only have one partner) and if you have the extra coils, you can make a 6:1 system. I was out of pulleys so I used a locking carabiner here. 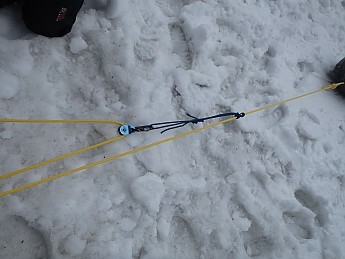 The anchors aren't depicted but are two 18" pickets dead-man placed 18-20" deep each, angles at about 10 and 2 o'clock. If this helps; cool, if not; sorry. Do it Pat, that would be really fun.